Whether we're in full-throttle holiday or not, household chores are things that very few of us get thrilled about making time for. Nobody likes household chores, but they have to be done. However, who says you have to pay an arm and a leg to automatically clean your home? So speaking of ALBOHES robotic vacuum cleaner, it is probably at the top of every homeowners' dream list. It is smart enough to navigate from one room to another throughout the entire floor of your home. Fully capable of cleaning all floor types. There is an auto-adjust cleaning head, which automatically adjusts its height based upon the floor type. Automatically docks and recharges itself when the battery gets low ( when the voltage is less than 12.8V ), it will recharge on its own then return to finish the task within about 6.6ft at hand until your floors are dirt-free. Equipped with 3 advanced infrared anti-collision sensors, this robot can detect objects in its path and navigate around them to achieve uninterrupted cleaning; while included cutting-edge anti-drop sensors: ensure the robot can clean up around stairs safely without falling. 4 optional cleaning modes meet different cleaning requirements to achieve maximum efficiency - zigzag mode, edge mode, spot cleaning and auto cleaning. 2 timing functions ( 24H / Go mode) allow you to schedule the cleaner through the controller to clean your floors anytime. Powered by powerful 2600mAh battery, it can work up to about 120mins on a single charge over all. Moreover, being able to climb for 15 degrees max, the robot can effectively cleaning different types of hard floors and carpets. Combined with clean and vacuum feature, as well as the led will flash red when the dust bin is full. Adopts 20W low power consumption technology which reduces your electricity bill dramatically, eco-friendly and energy-saving. Additionally, advanced brushless motor technology ensures low noise working and long service time. Supplied a controller provides full-scale accurate remote control. Ultra-slim body can perfectly fit for smaller spaces, like under your sofa, bed, etc. 1. If the color of the floor is dark ( ex. Black ), it means that reflectively of the floor is bad, at this time, you have to open the window to a larger scale. Please refer to the criteria of adjustment for adjusting the windows. 2. To avoid damaging the unit, please keep the cleaner away from water, and never operate it in wet room, such as bath and laundry room. 3. Never use it to clean high-pile carpet. 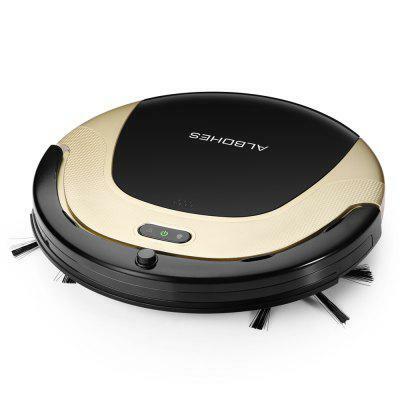 Want to be notified when the ALBOHES M504 Robotic Vacuum Cleaner gets even cheaper? Make sure you snag the best price by entering your email below. We'll email you when the price drops, free! We're tracking the price of the ALBOHES M504 Robotic Vacuum Cleaner every day so you know if that deal is really a steal! Check back for to check the best price for this product - and whether its current sale price is really the cheapest it's been! No ALBOHES M504 Robotic Vacuum Cleaner coupons found!